This will be the final installment of my review of the history of Nikon cameras. In this last edition I will concentrate on camera models that were born of Nikon's highest-grade cameras. The discussion will focus on titanium-coated cameras as well as cameras Nikon made for NASA. I'm certain that many readers will be seeing this information for the first time. When a focal-plane shutter camera with direct optical viewfinder is pointed toward the sun, the lens acts as a magnifying glass and the shutter curtain serves as black paper which was found during experiments performed with children (Caution ! Never look at the sun through a camera. Retina damage and blindness may result.). As a result, the sun may burn a hole in a shutter curtain. It is said that normal cloth shutter curtains may be damaged if a camera is pointed toward the sun without the lens cap and with a lens aperture set at brighter than f/8. In 1957, Nippon Kogaku K.K. started working on developing a thin, burn-resistant material for shutter curtains. The laboratory determined that they should aim for pure titanium sheets used in industry. Titanium, which is ultra light and has high flexibility, was regarded as suitable for shutter curtains. It was, however, also well known as a material that was difficult to treat. With its improved treatment technology, Nippon Kogaku somehow succeeded in contorting the sticky material into the shape of a shutter curtain. However, Nippon Kogaku had many problems along the way, such as accuracy, scratches, damage, and performance when exposed to low temperatures. They gradually cleared these obstacles and were able to begin using titanium for shutter curtains in 1959, immediately after the announcement of the Nikon F. The Nikon F was an SLR camera, and the mirror prevented the sun from burning a hole in a shutter curtain. However, the Nikon F had a mirror up mechanism. With the mirror up, the shutter curtain might be burnt by the sun. The Nikon F, which was often used in the titanium curtain experiments, was the first camera to actually incorporate titanium shutter curtains. Later, the Nikon SP, which employed the same shutter unit as the Nikon F, also applied titanium shutter curtains. This was the beginning of the relationship between Nikon and Titanium. Through mass production, Nippon Kogaku refined titanium technology and made it a specialty of theirs. The Nikon F2 was introduced in 1971 as the successor to the F. With the F2, titanium was used not only for the shutter curtains, but also for the reflex mirror frame. Nippon Kogaku wanted to increase mirror speed without having to strengthen the driving spring. By applying titanium for the mirror frame, the F2's mirror unit became lighter and provided a shorter shutter time lag than the F.
The titanium used for the mirror was 20 times thicker than that used for the shutter curtains. For thicker titanium plates, metal molds were easily blunted via the conventional steel-plate treatment method. New treatment methods for punching and pressing needed to be developed. It was the technology for the reflex mirror frame — not for the more well-known shutter curtains — that eventually led to the development of titanium-coated cameras. For many years, it was generally recognized that camera covers were made of brass (copper/zinc alloy). As I have mentioned repeatedly in past articles, Nikon cameras have been used in some extremely trying conditions. The bodies of virtually all Nikon F and F2 cameras suffered dents after they had been used in the demanding professional photography environment. As an experiment, Nippon Kogaku made an F2 body covered by light, durable titanium. Although they experienced many difficulties such as in press-treating the finder unit, Nippon Kogaku gained the expertise necessary to produce a titanium cover that both looked good and was durable. Unlike today's titanium cameras, the covers of titanium cameras of that day were unpainted and the titanium showed through. Following the experimental product, a limited number of models were manufactured and a few models were actually marketed in 1978. Users commented that the titanium cover was not suited to professional use because the light color stood out too much and was too reflective. In 1979, several hundred of the Nikon F2 Titan (Black) models, with black matte leather-look covers, were manufactured and marketed on a limited basis. Later, Nippon Kogaku introduced the F2 titanium body with "Titan" engraved in the cover. The F2 titanium body, though manufactured and marketed in small quantities, gradually gained acceptance. I (Mr. TATENO) heard that the number of bodies produced with "Titan" letters engraved in them was considerably greater than the number of non-engraved bodies. The Nikon F3, the successor to the F2, was released in 1980. 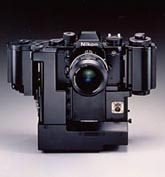 Two years later, in 1982, came the Nikon F3 High Eyepoint which enabled users to see the entire viewfield of the finder. The High-Eyepoint Viewfinder DE-3 was extremely popular among general photographers, as well as wearers of eyeglasses. Therefore, Nippon Kogaku decided that the F3 High-Eyepoint should be used as the base body for the titanium version of the F3. The F3's body was entirely black. To add the variety of color to their F3-series cameras, Nippon Kogaku manufactured the titanium F3 body painted in the color of titanium. That was the F3/T, released in 1982. In 1984, the black-painted F3/T models were released and continued to appear on the market longer than titanium color. By the way, the viewfinder cover of the F3 Limited (1994) was also made of titanium. Unlike the original F3 body, the titanium cover of the F3 Limited enabled an accessory Speedlight to be mounted on the interchangeable finders. Titanium was employed for the cover in order to strengthen the accessory shoe. We have talked about the titanium bodies of the F2 and F3. Nikon's pioneer titan cameras are superior to those of other manufacturers, in body design and durability as well. Competitors who tried to copy Nikon sometimes used negative techniques such as adding materials to improve press-treating. Nikon, despite the trouble with press-treating, continued to use pure titanium. After W.W. II, the U.S.A. had been involved in a race for space with the U.S.S.R., to gain ultimate superpower status. Both countries continued their work and research, and were able to execute a manned space flight by the 1960's. Around this time they had started using cameras for recording. At first, NASA (National Aeronautics and Space Administration) used primarily 70mm-format films. They found, however, that they needed a more portable camera for more active shooting situations. Nikon, whose cameras had a reputation for reliability in the U.S. market, was selected as a special manufacturer of 35mm cameras for NASA. Although the Nikon U.S. distributor accepted the order of the special cameras for NASA, a special team at Nippon Kogaku's Ohi Plant took charge of product development. A camera used in space would be subjected to a vacuum and zero-gravity conditions. As the spacecraft compartment is airtight, it is crucial that harmful gas or fire never be generated. The camera should be easy to operate for someone wearing gloves. And reliability became a major issue. The rays of the sun and their reflection on the camera body may be stronger than those on the earth's surface, and the weight of cargo aboard the craft should be limited as much as possible for launching, so there's no room for a spare camera in case the main one malfunctions. In order to meet these demanding conditions, Nippon Kogaku's special product development team used the Nikon F as the base body and made numerous modifications. For example, the leather-like body cover generally used for the Nikon F had been changed to a metal plate painted in matte black. Adhesive used adhered to NASA specifications. For plastic parts, materials generally used for F cameras had to be changed to specified parts. The battery chamber was designed to prevent accidental leakage from the camera body. Electrical parts were soldered in accordance with NASA standards. The standard thickness of the plating was modified. Dimensions were also changed to accommodate thinner polyester-based films. Modifications made to operating parts included an enlarged finger pad for the film advance lever, a larger film rewinding knob, and enlarged film counter figures and windows. Interchangeable lenses were also modified. The addition of two horns on the focusing ring was the most significant change. It made focusing simple as the user needed only to rotate the ring using the horn. NASA's standards for shutter accuracy were even more stringent than those of Nikon. The technologies Nikon used in developing cameras for NASA finally went into use in 1971. The modified F camera and some modified interchangeable lenses were provided to NASA for the Apollo 15 mission. Then, in 1973, a modified version of the F camera with a motor drive and modified lens were supplied for use aboard Skylab. The cameras Nikon developed for use in space exploration are still in use today, and maintenance is still being provided. These NASA cameras were of course very costly. It is said that Nippon Kogaku took heavy losses. However, these losses were balanced out by the value of the experience in the space project. Nippon Kogaku took what they had learned and used it to improve the reliability and operational performance of Nikon products. The development of the camera for NASA using the Nikon F body as a base and the development of the Nikon F2 occurred in parallel. NASA did not require increasing numbers of the modified F2 cameras, and in fact the camera was never actually manufactured. After some time had passed, Nikon went to work on camera models for NASA that were based on the F3 body. There were the "Small Camera", which was equipped with a motor drive, and the "Big Camera" for long film that were delivered to NASA for use aboard the space shuttle in 1981. While the Nikon F3 was still being developed and many issues had yet to be decided, NASA went ahead and formally declared the Nikon F3 to be an official NASA camera. The F3 models for NASA, and those for mass consumption, were developed side-by-side at the Ohi Plant. Another special team was assigned to the development of the F3 for NASA. The "Big Camera" was equipped with an interchangeable film back and used a thinner special long film for bulk loading. Members of the special team needed to concentrate on developing a new technology that would accelerate film advancement. After much effort and brainstorming, they solved the problem and succeeded in delivering the cameras for the space shuttle. The F3 for NASA had many of the same features as the F3 for mass consumption, including internal parts. Compared to the modified F models for NASA, the F3 for NASA was much more similar to the F3 models made for the public. 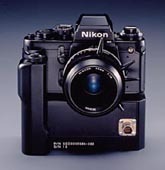 In 1989, Nikon delivered the modified F4 to NASA. There were only a few small differences between the modified F4 and mass-consumption F4 models. Nikon positively applied the experiences obtained during development of NASA cameras to the development of cameras for the general public. At the same time, NASA learned about the specifications that were required for the camera's use in space. These were the reasons why very few modifications were required for recent NASA cameras. In this final issue, we've talked about Nikon's titanium cameras and the cameras they developed for NASA. These cameras are tough enough to withstand the most unusual and severe conditions. During the Korean War in the 1950's, Nikon cameras gained a reputation for high performance in extremely low temperatures. Since then, Nikon cameras have been put to the test in myriad situations around the globe. The development of titanium cameras and special cameras for space use were two ways Nikon was able to show its true strength and prowess. These experiences also contributed to a rise in the performance of subsequent Nikon products, thus broadening the user base and increasing consumer confidence. This shows how much effect users actually have on the development of Nikon cameras and Nikkor lenses — by relating their own experiences using Nikon products. As I look back over the first 11 issues of this column, I see the same thing. I firmly believe that Nikon will continue to offer excellent products if it maintains, and improves, this connection with its users. This is a heavy responsibility for Nikon to bear, but one that will serve them well in the years to come. This ends my review of the history of Nikon cameras. I'd like to thank you for reading this column, and I hope you'll continue to access Nikon's homepage for more interesting information.